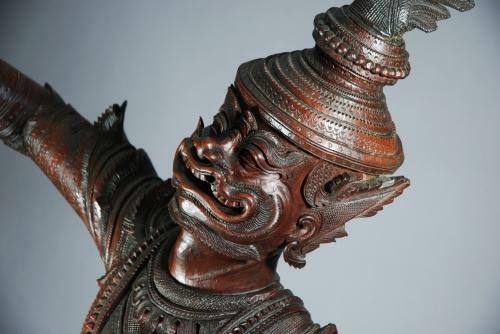 A late 19thc extremely decorative & finely carved large hardwood (possibly teak) Burmese figure of a dancer. This figure is shown dancing in ceremonial dress & is quite unique due to the sheer quality & size. These types of figures are sometimes found on a smaller scale & lesser level of carving but this piece has exceptionally fine quality carving & is of a substantial size. This figure would be a great statement piece, suited to any home or corporate setting.